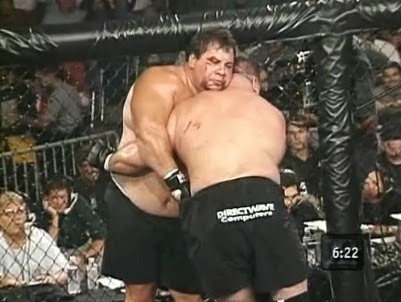 Tank Abbott and Mark Coleman are hyped as the favorites for tonight’s eight-man tournament. Abbott is back from a disciplinary suspension, while Coleman beat Gary Goodridge and Don Frye to win UFC 10. Bruce Beck, Jeff Blatnick and Don “The Dragon” Wilson will call the action, and Rich Goins is the ring announcer. Here we go! Coleman is from Columbus, Ohio, and he comes in at 250 pounds. Sanchez is from San Antonio, Texas, and weighs 300 pounds. What is Asax? The announcers don’t know, and neither does Google, Wikipedia or Dictionary.com as they are invented over the years. Coleman takes the big man down, lands some punches and taps out Sanchez in 44 seconds with a choke. Nice and efficient when Coleman has two more fights to go. Nasri is a world-class wrestler from Iran, and he has some kung fu experience. Johnston is from San Jose, Calif. He beat Scott Fiedler at UFC 10, but he lost later that night to Don Frye. Johnston is wearing American flag shorts. He takes Nasri down, lands some headbutts and just destroys Nasri with huge punches from the mount. McCarthy stops the fight at 28 seconds and actually apologizes to Nasri for not stopping the carnage even sooner. Abbott takes Adkins down and uses his 300 pounds to establish side control against the cage. Don Wilson notes that Abbott has won a fight by driving his opponent against the fence. Blatnick says that won’t happen again…but it does! Abbott wins at 2:06. Tito Ortiz was in Abbott’s corner; both men are from Huntington Beach, Calif.
Gurgel, a Gracie Academy student, comes out behind the Brazilian flag. He says he’s going to take the fight to the ground and go for the submission. Bohlander is a student of Ken Shamrock. He beat Scott Ferrozzo at UFC 8 before losing to Gary Goodridge. They battle over a takedown and finally end up with Gurgel comfortably on his back, pulling guard. Bohlander lands a strong punch and then kicks the grounded Gurgel, which gets him a warning because he’s wearing shoes. I check the DVD cover. “There Are No Rules!,” it shouts. Gurgel blasts Bohlander with a right to the forehead, drawing blood. Gurgel gets top position on Bohlander and tries to pass his guard. Bohlander breaks free and now he’s on top, throwing punches and headbutts. The fans start a “USA” chant for Bohlander. The announcers talk about how Gurgel and other BJJ fighters don’t like the 15-minute time limit, which runs out. “You can’t win a fight laying on the ground, holding onto the man,” Wilson said. He’s right. Bohlander gets the nod from all three judges. Johnston opens with a pair of leg kicks. Coleman, a former Olympic wrestler, hits a double-leg takedown and maneuvers into position to drop some heavy bombs. Johnston turns his back and then taps out at 2:20. Bohlander got hurt during his grueling slugfest with Gurgel, so he can’t continue. Scott Ferrozzo, who won an alternate bout, will take his place. Abbott, who used to be billed as a pit fighter, says that was something “they just made up.” I'm so disappointed. But not for long, as Ferrozzo carries the banner for the elusive art of “pit fighting.” Abbott weighs 298, and Ferrozzo, whose father played for the Minnesota Vikings, weighs 350. Abbott claims to have more assault arrests than everyone else in the UFC combined. His lawyer, watching at home on pay-per-view, shushes the TV. After a bar-fight slugfest, Ferrozzo tries a takedown, but Abbott slips behind him and we get lots of battling against the fence and trash-talking. Don Frye is in Ferrozzo’s corner, shouting advice. Ferrozzo lands some knees and uppercuts, and he is holding his own against Abbott. McCarthy temporarily stops the fight so the doctor can check a cut on Ferrozzo’s forehead. They slug it out again and wind up against the cage, where Ferrozzo lands a strong series of knees to the stomach. Abbott has Ferrozzo against the fence but isn’t doing anything. McCarthy finally separates the fighters with 2:30 to go. After a punch exchange, they go right back to the fence. The fans boo. These guys are gassed, and Blatnick correctly says Coleman is in great shape to face the winner. Time expires, and since we’re in the semifinals, we go to a three-minute overtime. Both men throw leather, have a spell of inactivity on the fence, then fire more bombs at the end. Ferrozzo clearly won this one. Let’s see if the judges agree. Yes, they do. The judges misspell his name “Ferrozo,” but he’s used to it because his own cornermen have it spelled “Ferrazo” on their shirts. Shoot, I called him "Sam" in this article until I just went back and corrected it. Ferrozzo credits Don Frye’s training for the biggest victory of his career. Abbott says he wasn’t prepared to fight a bigger guy. After that gut-wrenching performance, Ferrozzo can’t continue. This means Roberto Traven, who won the other alternate fight, goes all the way to the finals to face Coleman. Traven beat David Berry Jr. in the other alternate bout at 1:33 with a tapout to punches from the back. But he broke his hand, so there’s nobody left for Coleman to fight. No final match. Mark Coleman wins his second straight UFC. Good night, folks!